Apricots are one of the smaller stone fruits. The skin is smooth and soft with a golden orange colour. The fruit contains a loosely connected pit in the centre. The apricot is not too juicy but definitely sweet. Apricots can be enjoyed fresh, dried, grilled, cooked into pastry and jams. 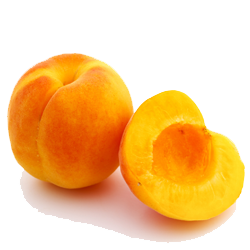 Choose apricots that have a rich orange colour and are slightly soft to the touch. Apricots are available in the late spring through summer. Tree-ripened fruits are at their peak and taste the best. These fruits are delicate and perishable.